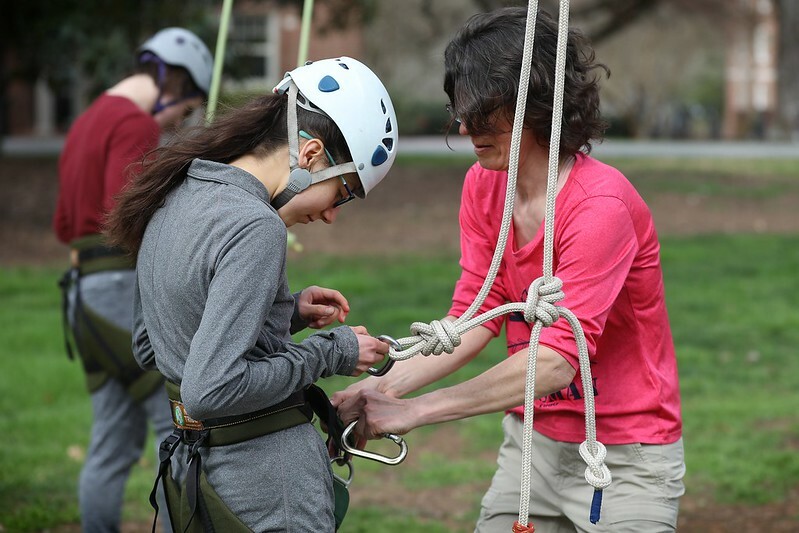 When she heard about a tree climbing session featuring one of Davidson College's stately oaks, she finished her last class on a Thursday afternoon and geared up. "I really enjoyed being up in the branches and looking at the campus through the treetops," Soifer '20 said. "It makes you realize how big nature is, and that you're just a small thing in this giant world." Davidson Outdoors worked with alumna Linda Tatsapaugh '88 to host the climb. Tatsapaugh came to campus hoping to recruit students to serve as counselors for Talisman Summer Camp. Based in the western North Carolina mountain town Zirconia, the camp works with kids who have autism and ADHD. Campers take on nature's challenges, such as hiking and climbing, to help build self-confidence and social skills. Davidson College students, including Tatsapaugh's son, Daniel Lammens '21, have worked there in past years, and she hopes to find a few for this summer. "I need two climbers and five more counselors -- I'm partial to Davidson students," Tatsapaugh said. "They're always very competent problem solvers and show great integrity." Soifer, a biology major from St. Louis, said she'd probably love the camp counselor job, but already has a Dean Rusk International Studies Program grant to study orchid conservation in Europe. She's previously studied various aspects of rainforest conservation in the Amazon, Australia and Costa Rica and is a member of the Davidson Outdoors student club. Thursday, she felt like a kid again. "Nature is a place where I feel very relaxed," she said. "You do get a bit of a head rush if you stay upside down long enough -- but it's really fun."